This antibody recognizes both the free and protein-conjugated (either soluble or cell bound) form of biotin. 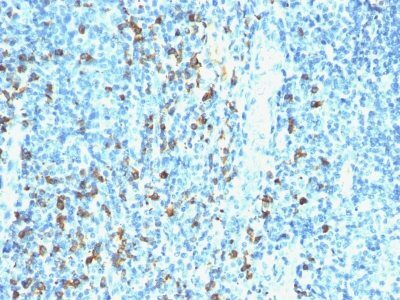 This antibody recognizes both the free and protein-conjugated (either soluble or cell bound) form of biotin. This MAb is highly specific to biotin and shows no cross-reaction with other structurally related compounds. It has a very high affinity for biotin and is excellent for use in various amplification techniques. In some applications, localization of biotinylated probes with avidin produces unacceptably high background staining. Anti-biotin antibody may be substituted to decrease this noise. Catalog number key for antibody number 0400, Anti-Biotin (Hyb8) The prefix indicates conjugation, followed by the antibody number and size suffix.